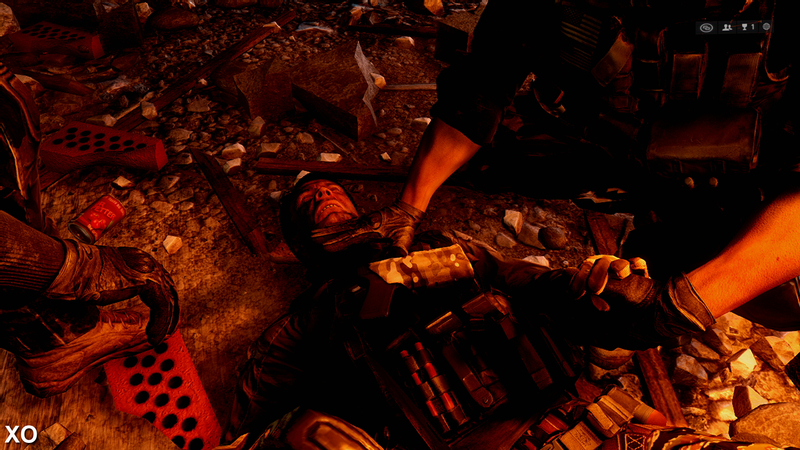 Update 29/11/13: This article is based on near-final code we tested at an EA press event. The retail game has now been analysed in-house, so please refer to that article for a deeper understanding of the game. Update 29/10/13: We've produced a short Q+A answering some of the questions about this article, specifically the accuracy of our captures. The wait is, at last, finally over. Having followed a year-long trail of technical titbits on the Xbox One and PS4's silicon and circuitry, the debate over which platform "should in theory" come out top can now be met with some concrete results from actual software. 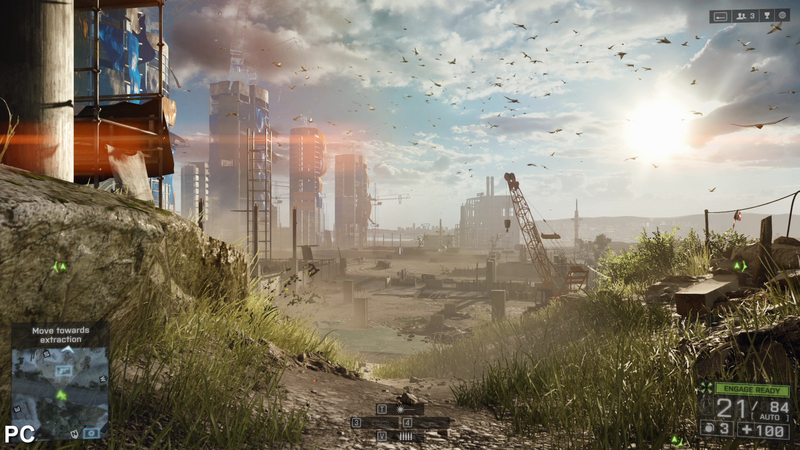 This is courtesy of an exhaustive three-day bout of capturing both next-gen versions of Battlefield 4 - plus PC for good measure - in DICE's home city of Stockholm. Through this, an early triple-format Face Off preview of this year's most ambitious multi-platform FPS is now finally possible, with a set of initial results that may (or may not) surprise. First up, a few crucial points on our test methodology. It's worth noting that these captures are taken from Xbox One and PS4 development kits, as used by the game-makers themselves to ensure the game runs within the parameters of the retail hardware released this November. Also, the code is what DICE claims to be in a near-finalised state, where only very minor tweaks will be implemented over and above what we're seeing here. Day one patches will no doubt be in the pipeline, but clearly this is a build in which confidence has been placed; Electronic Arts' reps put up no boundaries between us and each version of the game, leaving us entirely to our devices. But we have to stress that we will be re-testing on production next-gen console hardware, with any day one patches installed. So, before loading the game up, we make sure to have full RGB set in both the Xbox One and PS4's system setting menus, to maximise the 0-255 colour space used on PC monitors and supported by our capture hardware - and of course, we have the system video resolution ticked at 1080p. 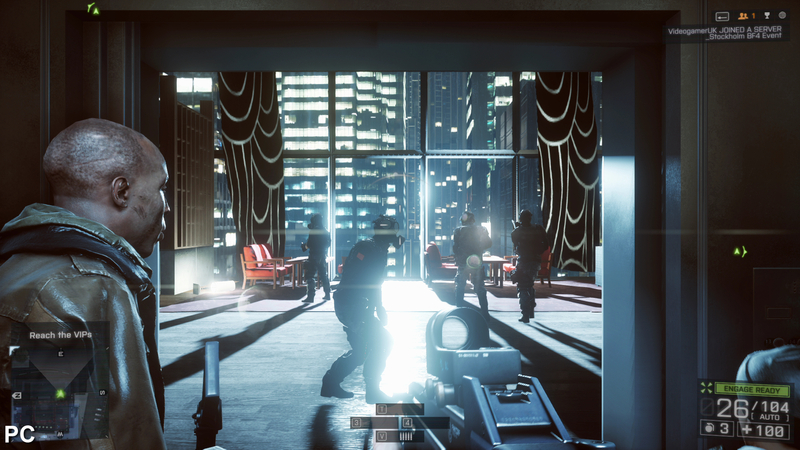 Once the game is booted up, we also make sure that Battlefield 4's brightness setting is set to its default 30 per cent - a factor which has relevance a little further on into this piece. Of course, the extra guest present at this shoot-out is the PC version, considered the definitive release by ardent series fans. To make a point of where the next-gen versions stand in the graphical spectrum this is worth considering, and we capture PC on its maximum "ultra" settings at 1080p. This is inevitably demonstrated at the event on an absolute monster of a PC set-up: just its eight-core AMD FX-8350 CPU, 8GB of RAM and dual-Crossfired HD 7970s would cost us around £680 in total - not including the HDD, motherboard and PSU also needed to form the bedrock of the machine. At half the expense in overall hardware costs, having the Xbox One or PS4 versions even get close in terms of performance would be a remarkable feat indeed. "PlayStation 4 offers a commanding lead in terms of resolution - it's 720p vs. 900p, with what looks like some very curious processing on Xbox One to boost detail." 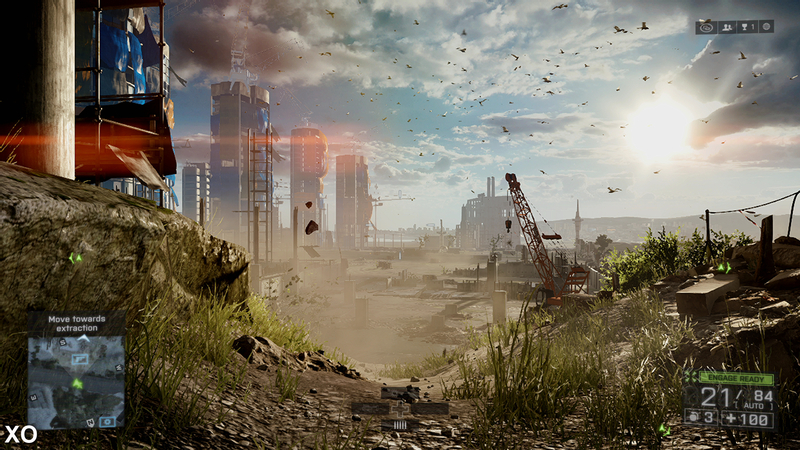 A preview of the PlayStation 4 and Xbox One versions of Battlefield 4, as captured from near-finalised code. For the most accurate representation of what to expect in visual quality, make sure 1080p is selected. For equivalent comparisons with the PC version at ultra settings, check out the videos below. To kick things off, we have a 60-image next-gen comparison gallery for Battlefield 4, plus a trio of lengthy eight-minute Face-Off videos above - in any combination of platforms you'd prefer to see. Each of them is illuminating in its own right. Needless to say, there are some basic differences in image quality that need knocking on the head right away. Chief among them is the hot topic of internal resolution, where we determine that the Xbox One code is indeed running at 1280x720. If this is set in stone for release - as is likely - the Microsoft version is poised to give us the most aliasing of the two next-gen platforms by a noticeable degree, and is only a stone's throw from the sub-720p resolutions of current-gen releases. On the other hand, the PS4 version delivers a whopping 1600x900 resolution in all modes, giving it a 50 per cent lead in output pixels overall. As well as cutting down on jagged edges, this reduces the amount of pixel shimmer we see in motion on complex shaders or thin geometry, with distant power lines, scaffolding and other elements with sub-pixel elements creating unwanted flickering on Xbox One. But the differences we saw don't just stop at resolution. Both versions are treated to post-processing anti-aliasing too, seemingly equivalent to the refined, high setting on PC. However, this doesn't tell the whole story. As you may notice in our screengrabs, the actual results on PS4 lack the corresponding level of crystal clarity we'd expect of such a significant resolution boost. This should surely be a home run for Sony's console, but what is likely to be a software-based upscale to 1080p delivers less-than-stellar returns, and for better or worse leaves the Xbox One with an often crisper looking, albeit much more aliased image. What is curious is the level of "pop" given to the Xbox One's textures, where - bizarrely - artwork often seems to be more detailed than on PlayStation 4. In high contrast scenes, we sometimes see a kind of halo effect around some detail, which may suggest some kind of artificial detail-boosting post-process. Whether this is part of Microsoft's new upscaling tech remains to be seen, but we were reminded of the Medal of Honor effect seen in the Darbee Darblet review. However, what is added to texture detail also seems to be applied to XO's most ugly element - its highly noticeable sub-pixel break-up. There's no doubt resolution is a big differentiator when it comes to image quality, with the PC untouchable here on its ultra settings. 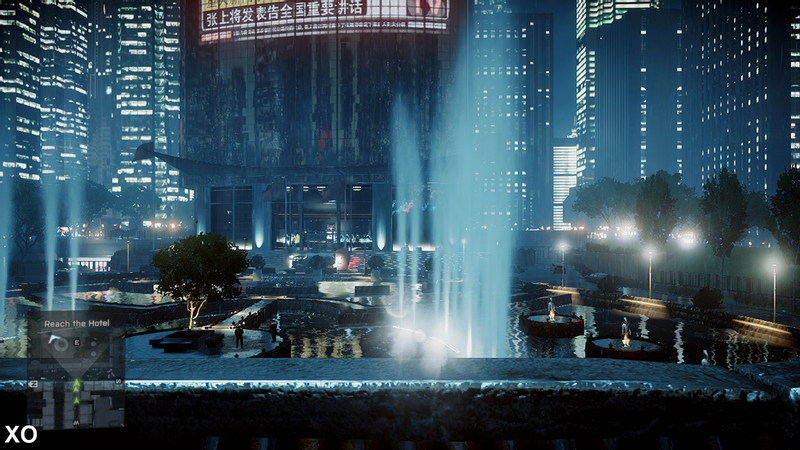 The PS4 version runs at 1600x900, while the Xbox One's lower 720p resolution brings out the most aliasing. 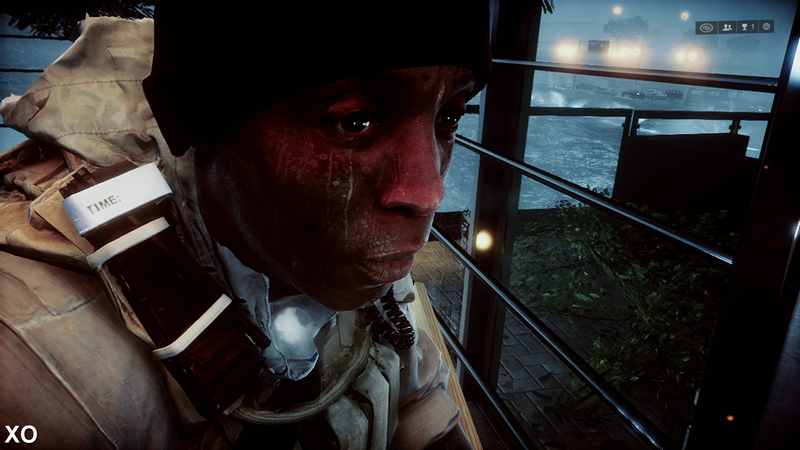 Anti-aliasing is of the post-process variety, matching the high quality setting on Battlefield 4 PC. It's effective for the most part, but you're going to see sub-pixel shimmer on thin objects in the distance - especially so on the lower resolution Xbox One. Alpha buffers are lower in resolution compared to the PC release, as shown in the fountain in this shot, and licks of flames elsewhere. 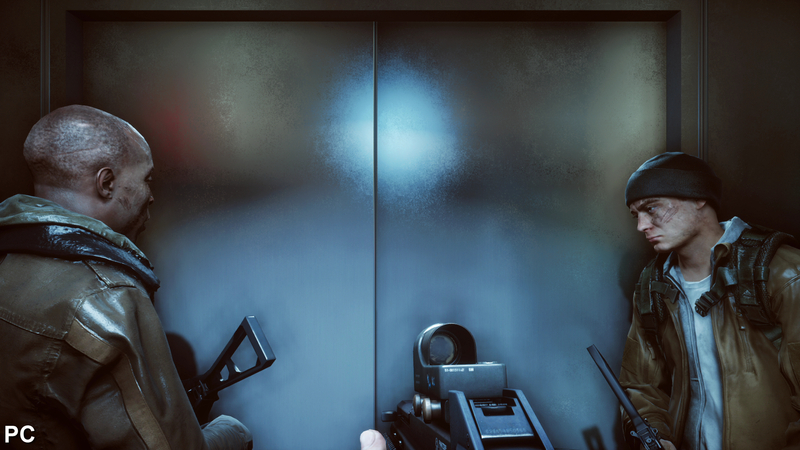 A delay in texture streaming also afflicts the PS4 version in occasional spots - such as the concrete wall in the foreground. Shadows and lighting are very similar indeed across the board - consoles for once matching settings on PC. Regardless, the overall impression is that the gap is closed just a touch between the Microsoft and Sony platforms. The soft blur on PS4 comes across as a missed opportunity given the extra leg-work needed by the PS4's troves of GDDR5 RAM and GPU compute units to hit this 1600x900 mark. Nevertheless the image in motion is clearly the superior of the two - if not quite the knock-out smash we'd expected based on the raw metrics. As the template for what could be achieved with zero upscaling, the PC version highlights the benefits of running at a full 1920x1080 and the 4x MSAA provides the icing on the cake in terms of image quality. Where marking out enemies on the horizon is concerned, the heightened pixel count on an unfiltered, multi-sampled image makes for a tangible, desirable difference. This leads us to a second issue that affects both console releases: gamma levels. We went into the review event having never hooked up our equipment to either next-gen platform before, and our tests with BF4 gave some curious results we want to revisit with the final game on retail hardware. Similar to the Xbox 360, Microsoft's new platform seems to enforce a colour push towards the lower end, leaving us with more saturated colours and deeper blacks. 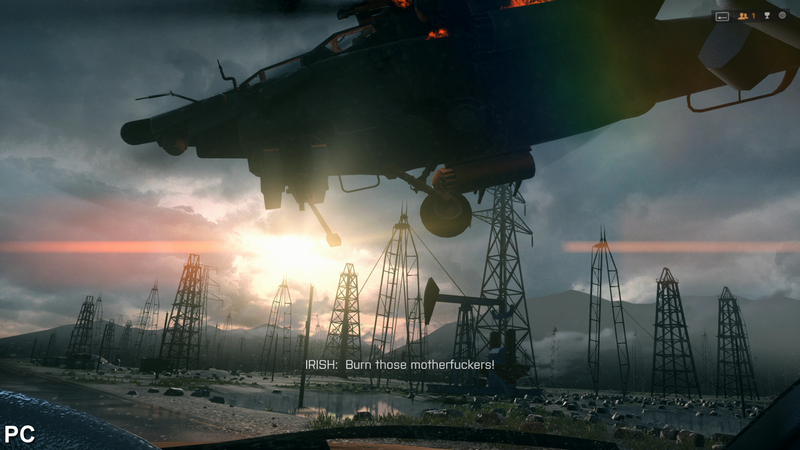 It's just cause to head towards Battlefield 4's brightness settings, but in the interest of a fair test we kept this at the default 30 per cent for all platforms. Curiously, the top end is also affected, causing the image to appear distinctly washed out, as if set to limited range. This is particularly evident on PS4, which is kept free of a comparable black push to Microsoft's platform to compensate. Right now there's every possibility that it could be a capture situation, but it is worth noting that we saw no such issue on our PC captures and after returning to base, the same equipment produced a perfectly balanced picture on our PlayStation 3. Texture mapping and object positions vary between the three versions - none especially better or worse. Here we have the PS4 with different ground texture maps, while the PC adds background geometry to the top-left of the scene. 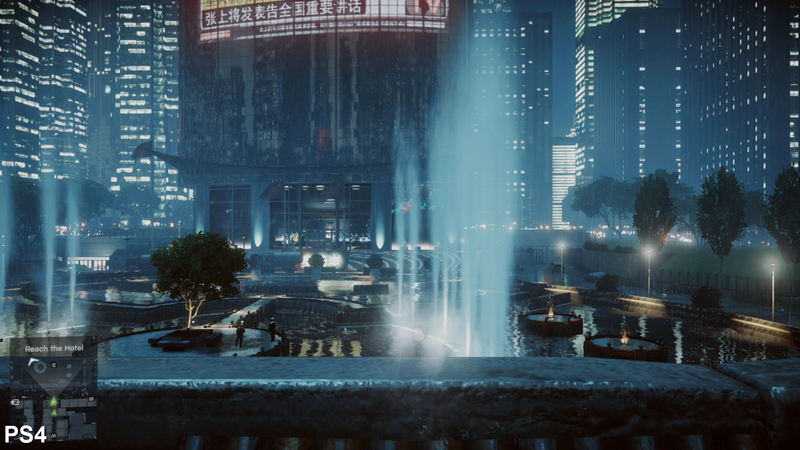 While the PS4's higher internal resolution reduces aliasing, the console's scaling method blurs high-density shader details - such as wet, reflective surfaces - more than it should in still images. Fortunately, it looks much better in motion. It's all in the game. Characters like Irish are brought to life by some superb hand-keyed facial animations. It tips into the uncanny valley due to the gormless looking eyes though, as if all characters' lines of sight are fixed straight ahead. The PS4 uses the same grade of ambient occlusion as PC on maximum settings, listed as the horizon-based approach. This manifests as a shaded contour around the player's gun and hands while near walls, an effect curiously missing on Xbox One. DICE says that AO will be in the XO version at launch. Otherwise, differences between the two fall into nit-pick territory. Ground textures appear different during the campaign mode, with variations of the same texture being planted in the same spot. Neither one is especially greater in detail, suggesting these tiles are partially randomised, much like the soldier camo designs on our character's arms. 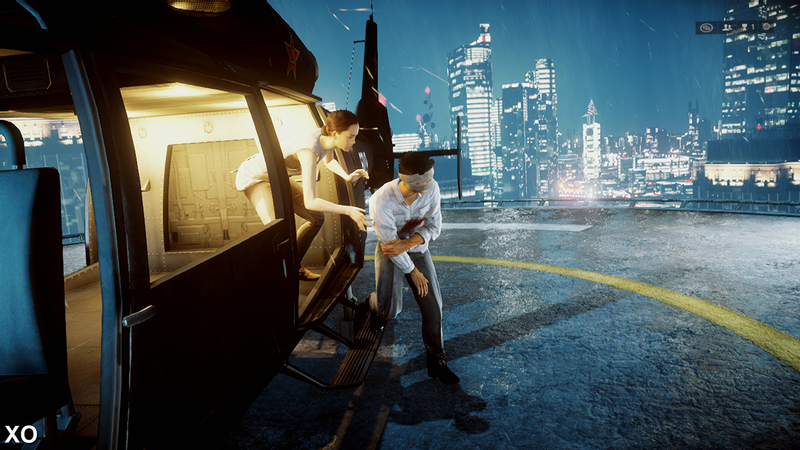 The PS4 does on occasion suffer from a slight delay in drawing in higher textures, and likewise, the lens flare effect in some scripted driving scenes on the Shanghai level fails to materialise. These are rare and subtle contrasts; otherwise, all lighting effects such as god rays, bokeh depth of field, shadows and physics are indistinguishable between the two - also true of draw distance on minor objects for massive 64-player online maps. Both PS4 and Xbox One versions are sights to behold having spent eight years with current-gen platforms, but in their current states, neither can topple the PC's crown at ultra settings - instead coming in closer to its high setting. Cutbacks have been made, including lower resolution alpha used for water and fire effects. The PC also achieves unnoticeable level-of-detail (LOD) streaming as we run across the battlefield, while grass tufts and rocks still visibly fizzle into view on next-gen platforms. Lighting and bloom take a knock too in the step from PC, and it's apparent that individually lit particle effects are used more liberally in like-for-like cut-scenes. The gap is there, but as it turns out, this is all for the greater good of performance. 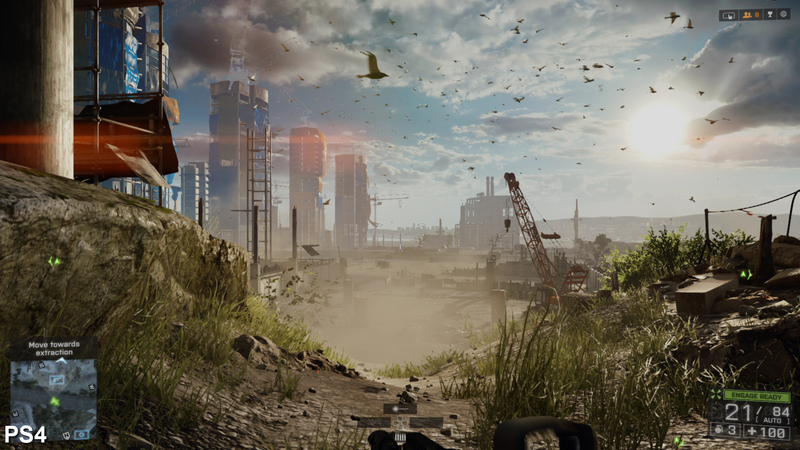 DICE's flagship shooter series has gone from strength to strength in recent years, with the Frostbite 3 engine readily adaptable to the eight-core CPU setup of the Xbox One and PS4. At last, the series is given some breathing room on home consoles when balancing between visuals and performance; unlike the last generation that struggled on both fronts, we can now have our cake and eat it. With a v-synced 60fps target in mind for all modes, the ambition is clearly to eliminate the input latency inherent in the target 30fps feedback on Xbox 360 and PS3, and replace it with snappier controls to encourage true, competitive online play. To get a sense of how frame-rates compare in like-for-like tests, we synchronise cut-scenes and pair up some of the campaign's more flavoursome battles. The turnout is a convincing 60fps throughout the relatively short four to five hour campaign, with dips to the 50fps mark only perceptible during rare moments in cut-scenes of the Shanghai and China stages. "In single-player, we had to work pretty hard to isolate the performance drops in what is a mostly solid 60fps experience." 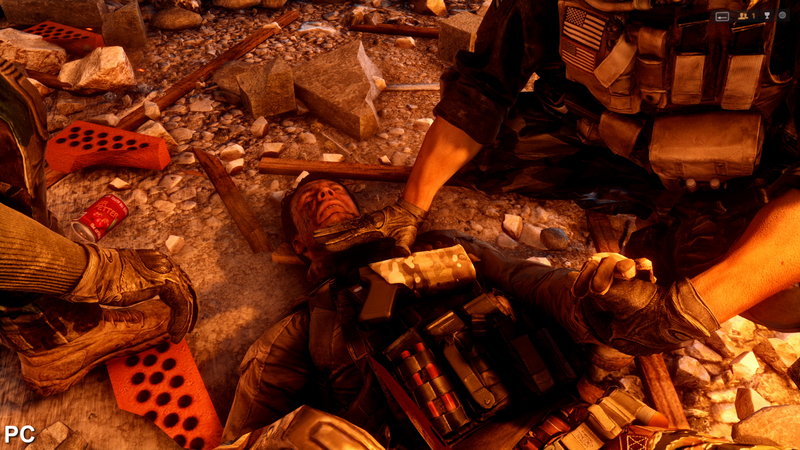 Battlefield 4's performance is almost perfectly handled in campaign mode, with the avoidance of full 1080p allowing both PS4 and Xbox One to deliver smooth 60fps playback with v-sync engaged. Exceptions are few and far between, with drops to 50fps seen in three cut-scenes here, and once down to 30fps during an explosive battle. Having moved ahead in terms of image quality, there's no doubt that Sony's new platform comes out on top overall in the performance metrics too. This is best demonstrated in matching sequences, such as a cut-scene on a Shanghai river where it commands a constant 2-4fps lead, and likewise during the tearing apart of a battleship. In terms of gameplay, the gap widens further during the cannister explosion on the Fishing in Baku stage, with a disparity at well above these numbers - the PS4 regaining 60fps much faster than the fluctuating Xbox One code. We see occasional XO wins in like-for-like testing too, but in our single-player tests, it is clearly the PS4 code that is in the ascendant. 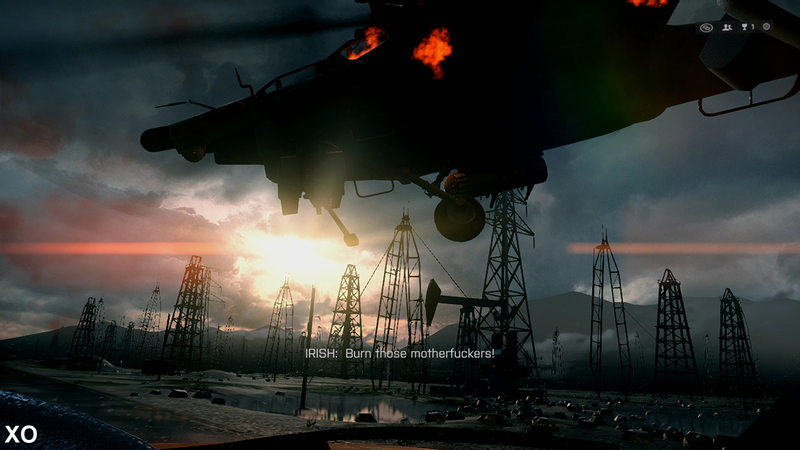 But for many, the multiplayer mode is where the true Battlefield experience begins; no linear corridors that pervade much of the campaign mode's design, and instead wide dust-bowl areas with destructible buildings, vehicles, plus DICE's new "levolution" destruction mechanic that transforms the physical dimensions of the stage. Unfortunately, while multiplayer was scheduled for the majority of day one at the EA event, the on-site network was non-functional, resulting in campaign-only XO gameplay and an early finish to the session. These issues were fully resolved for day two, allowing us to spend several hours testing multiplayer on the PlayStation 4 version of the game. The result isn't quite as flattering as the campaign mode, but still strong. On 64-player Conquest mode variants of maps such as Lancang Dam or Flood Zone, we get between 40-60fps while in the thick of the action. Sadly, these frame-rate hits do impact gameplay where control latency is concerned. 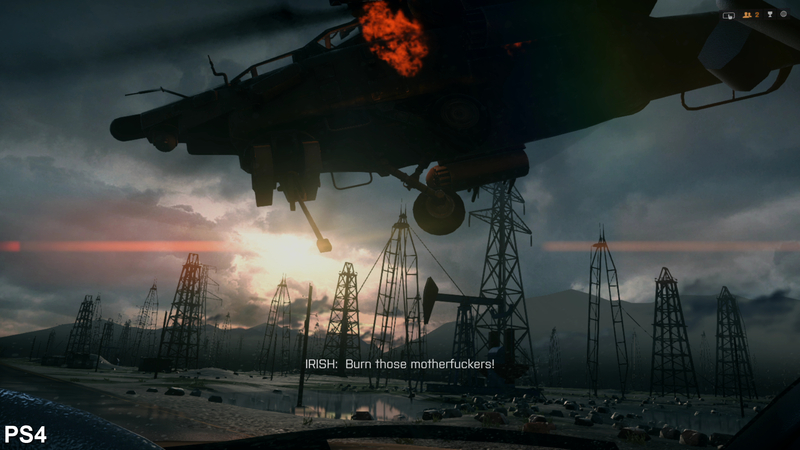 The trade-off is worth it, owing to the sheer acreage of these battlefield environments, the support of up to 64 players, and the destructible nature of the environment - unparalleled among its competition. "Multiplayer on PS4 sees a noticeable drop to the average performance level, so not being able to see the Xbox One version's rendition of this crucial experience is a real shame." Multiplayer games with up to 64 players run mostly at 60fps on PS4, but the frequency of the drops below is disappointing. We'll have more to say on how each version's multiplayer compares come the final release. In terms of the more experimental features available to consoles, it appears Kinect support is etched in on the Xbox One side. While the hardware wasn't available to us at the time to give it a try, the menu tab at least shows that there are options for voice commands, plus body-tracking that translates a player's left or right lean into the game. We have to admit that we're quite intrigued to see how head-tracking works in addition to this, not to mention the implications for multiplayer gaming. Tablet integration is also included for all next-gen platforms via an app that connects to your Origin account. While there is some sluggishness to menu navigation, the ability to ogle a larger map propped up below the HDTV does comes in handy on the bigger stages. This updates in real-time with info of your position and the whereabouts of allies, and also makes it possible to configure load-outs independent of the on-screen action. A luxury, if you have the means, but neat nonetheless. 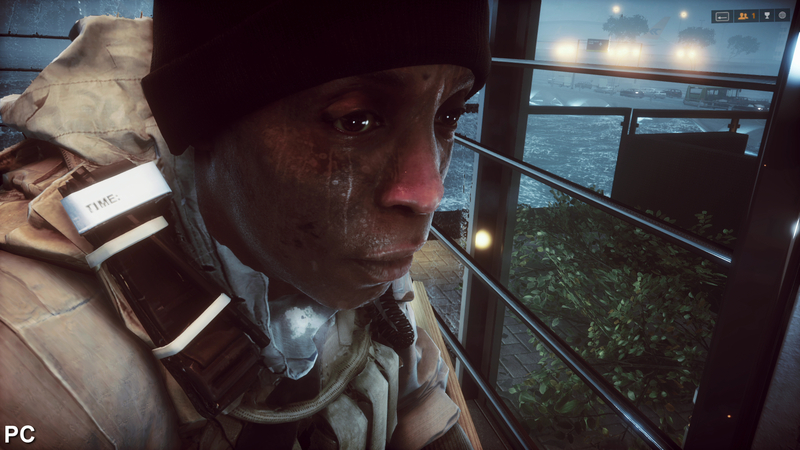 All in all, we can only give a preliminary outline of how Battlefield 4 will run on next-gen consoles, but there's plenty here that should remain the case for the final release in November. Perhaps the biggest takeaway is that, in this near-finalised state, the PS4 offers a superior experience on several fronts. The resolution is higher at 1600x900, as compared to the tried and tested 1280x720 on Xbox One, suffering as it does for more visible aliasing artefacts. Visually, the PS4 has a marked advantage with ambient occlusion effects too, which simply isn't matched on Microsoft's platform with the build we played. 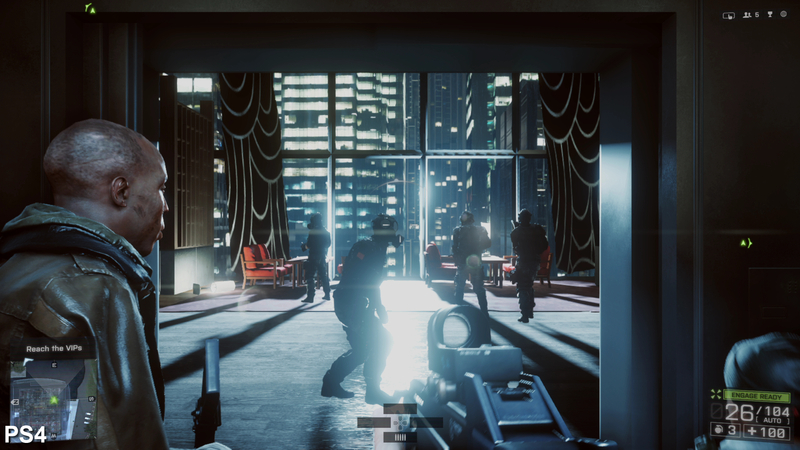 "We saw plenty at the Battlefield 4 event, but we will be revisiting the game on retail hardware and giving the Xbox One Kinect and multiplayer modes the vigorous testing they deserve." 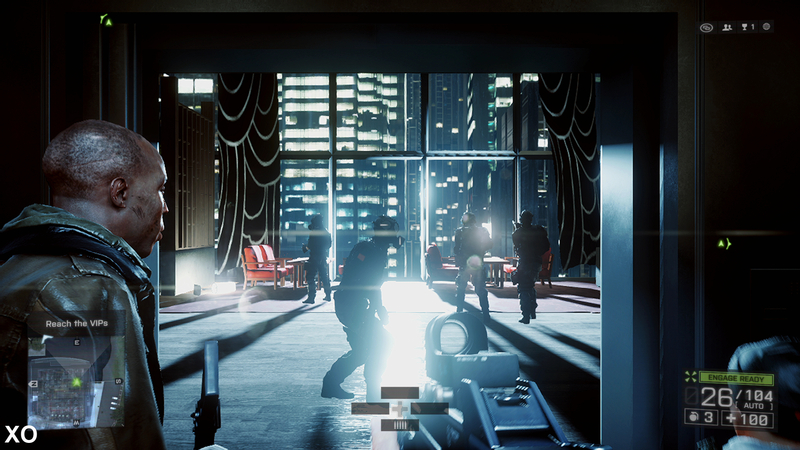 No Xbox One Kinect cameras were on-site during EA's Battlefield 4 event, so we couldn't test this functionality - but we can show you the options screen. There appears to be no such equivalent screen for the PlayStation Camera in the PS4 version of the game. It's a shame that the upscaling issues on PS4 pull it back from absolute dominance in terms of image quality and performance that the metrics suggest we should be getting. 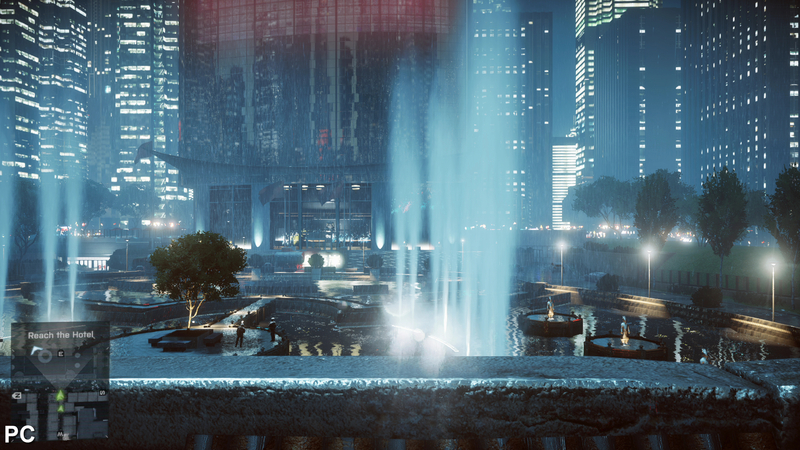 However, the games are running at equivalent to high settings on the PC version, while cut-backs in lighting, effects and draw distance mean we can play through the campaign at an almost uninterrupted 60fps. It can be argued that the image quality could have been raised a notch to the PC's ultra setting if not for this ambitious refresh target, especially given the frame-rate's struggles in multiplayer. On balance though, the performance is solid, if not quite optimal for 64 player maps at present. While we've been able to come to some interesting conclusions thus far, we have to stress that this is far from the definitive, final word - it's an assemblage of observations on image quality and performance acquired outside of standard conditions and indicative only of the build we saw at the event, running on development hardware. We will be revisiting the game on retail consoles and giving the Xbox One Kinect and multiplayer modes the vigorous testing they deserve. Over and above that, despite all the next-gen excitement, we shouldn't forget that there are still the current-gen versions of the game to cover too. 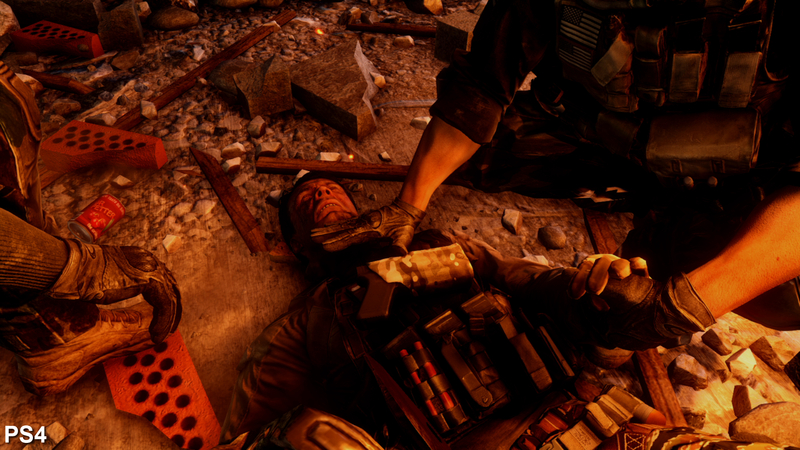 Our Battlefield 4 coverage is far from complete - there's much, much more to come. This article was based on a press trip to Stockholm, Sweden. EA paid travel and accommodation costs.